Even with paper taped against all the windows, the interior of the new downtown Magpie Cafe is bright and inviting. That paper is set to come down today, finally giving Baton Rouge a chance to peek in on the hotly anticipated second location for the Magpie team, which is scheduled for a soft opening next Wednesday, Sept. 28. Owners James and Lina Jacobs wanted to keep the look of the new space on the ground floor of the Commerce Building under wraps while it was in the design phase. But now that it’s nearly finished, “We’re ready to let in all that natural light. It’s what drew us to the space in the beginning,” Lina says. What passersby will see is a decidedly modern take on the original Perkins Road coffee shop’s relaxed and eclectic vibe. The high ceilings give way to exposed ducts and wiring, with a variety of lighting fixtures hanging throughout the dining space. Original and unfinished terrazzo floors and concrete columns give the restaurant an industrial feel, while white Danish chairs, pillowed banquettes and blonde woodblock tables soften everything up. 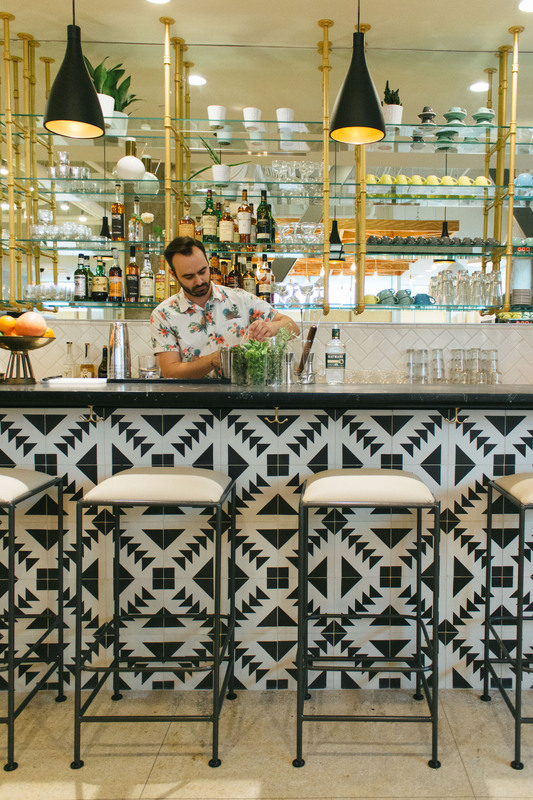 The stunning showstopper is the long bar lining the back wall with its black-and-white geometric tile work and black marble counter. Plenty of shelving with gold accents behind the bar signal the Magpie team is ready to join the Third Street bar scene with evening hours and a craft cocktail menu. The new downtown Magpie Cafe will offer a full cocktail bar. But also: Get a load of that tile! Throughout are personal touches that highlight Lina’s own eclectic sensibilities, like a midcentury family-style table in a front alcove, vintage sliding doors that separate a small private dining area, and an antique wooden display case built into the front counter that was a gift from friends. It once showed off the general store’s collection of men’s ties but will now be where customers can check out the fresh scones, muffins and cookies for sale. In the background, the main breakfast and lunch counter, where customers can find an antique display case filled with pastries and sweets. 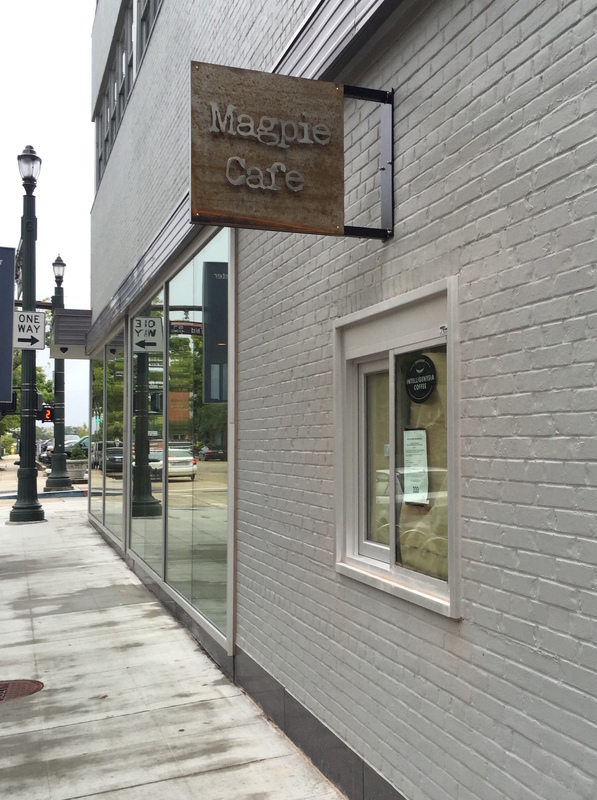 Speaking of food, the downtown Magpie will offer counter service 7 a.m.-4 p.m. with breakfast and lunch items similar to the original location. Look for the addition of fresh housemade breads behind the counter, as well. From 4 p.m. on, the restaurant vibe will kick in with table service and a made-to-order dinner menu until 10 p.m. For happy hour, the bar will serve shareable bar snacks to complement the cocktail menu. The food menu was still being finalized, but the house cocktails include the Paramount, a mixture of gin, Iris liqueur, black pepper syrup, rosemary, lime and cardamom bitters, while another unique take, the Lucky Roosevelt, features bourbon, spiced pineapple liqueur, honey, grapefruit and tiki bitters. Meanwhile, bottled beers—with Louisiana breweries well represented—will also be available. 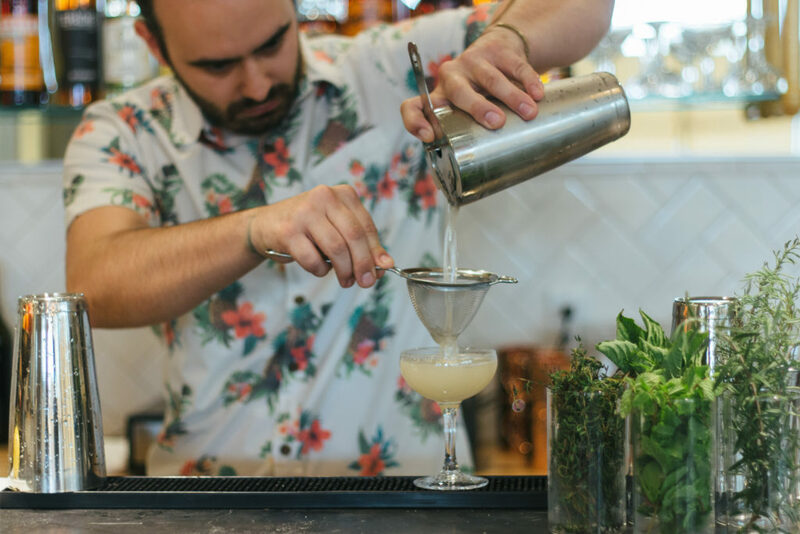 Bar director Lane Primeaux makes the Jolly Roger, a mix of mezcal, tequila, dry curacao, lemon, cucumber, jalapeño syrup and bitters. And of course, what’s Magpie without its much-celebrated coffee? 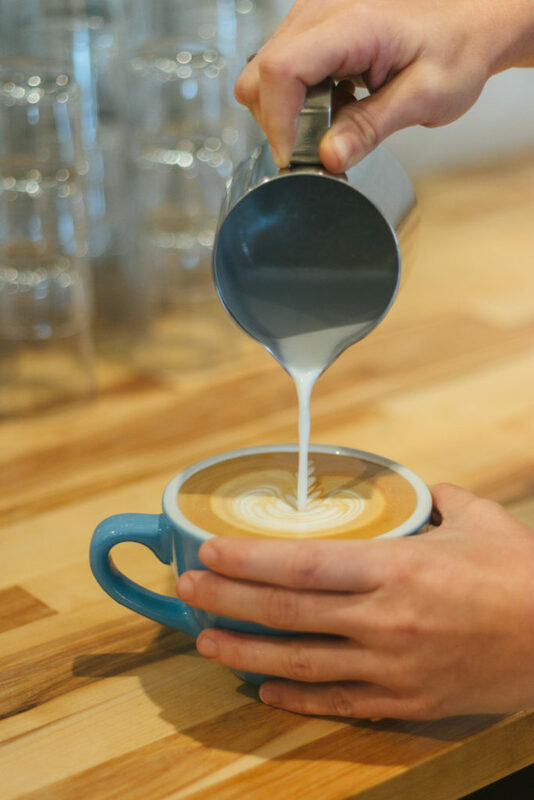 The new location will feature all the quality and varieties coffee lovers have come to expect, with the addition of a walk-up window facing Laurel Street where downtown pedestrians can quickly get their coffee fix. In all, the Jacobses added 25 new staff, from baristas to bartenders to kitchen staff, to accommodate the large new restaurant. Executive chef Tanner Purdum crafts the menu for Magpie’s monthly supper social with Lina and will oversee the kitchen. “We have a young but very passionate and creative team in the kitchen, so I’m really proud of that,” Lina says. With next week’s soft opening, Magpie’s staff will ease into the downtown business lunch and after-work crowd. Regular hours are tentatively set for Monday-Wednesday, 7 a.m.-9 p.m. and Thursday-Saturday, 7 a.m.-10 p.m. The team anticipates a full grand opening to follow—something the original location never got as it quickly became a local favorite. For the Jacobses, it’s amazing to look back at how this got started, with both of them leaving their jobs to launch the small Perkins Road coffee shop—James manning the coffee bar and Lina in the kitchen. As Magpie’s success grew and they tested the waters of a full dinner service via the supper socials (which will continue at the Perkins Road location), they began plotting where to take the concept next, with downtown always on their radar. “This has been in our pocket for a while,” James says. Find Magpie Cafe online here and check out their Facebook and Instagram for updates on the new downtown location. The Commerce Building, which houses the new downtown Magpie Cafe, is at 333 Laurel St. The original location is at 3205 Perkins Road. 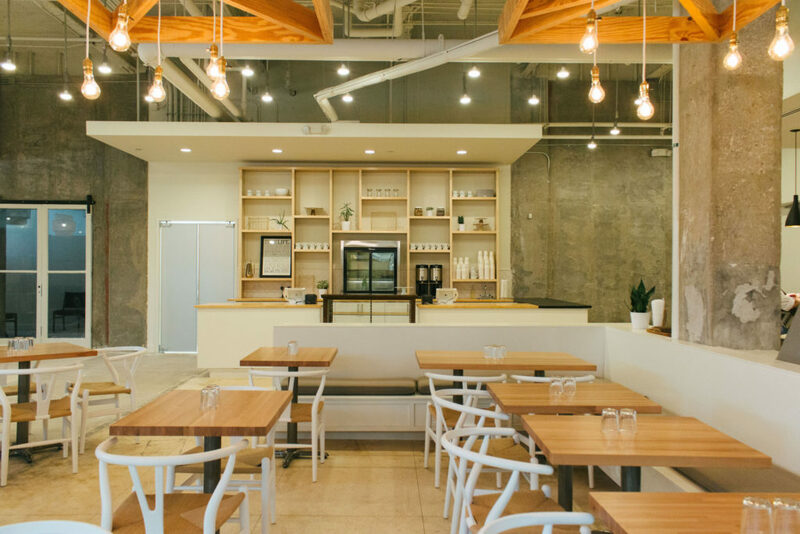 Not to worry: You’ll still be able to get that expertly prepared and Instagram-worthy coffee at Magpie’s downtown location.